Take pictures of creations that you like and copy them, but add your own personal touches to make it your own. Once you have done enough containers, the combinations are second nature, starting with just one really wonderful plant and working from there. Succulents- you can go on vacation and leave these without worrying! The best piece of advice that I picked up over the years was a secret to coordinating your colors in an arrangement. Choose a piece of fabric or piece of art that you really like, and take it with you when you plant shop. Of course, you can’t take a painting with you, so grab refrigerator magnets with famous paintings on them from museums, cut a swatch from fabric, or cut out paintings from magazines. Inspired by a Van Gogh, my most successful container used the colors from his iris painting. Van Gogh’s painting has that intense blue which so many people adore – also orange, greens, a touch of white and yellow. If you like it in a painting, you will like it in a container! I have plenty of room to plant in my beds but I really enjoy planting in containers because they become a piece of art in miniature. This is my opportunity to try new annuals that are untested by me, and go wild with the color combos. Bold, vibrant, and sizzling color, is the driving force for many of my combinations. To browse the new Pantone colors for 2018, check out Pantone. 2018 Ultra Violet. That inspired me to create containers with intense purples. I love the new AAS Winner Purple Evening Scentsation. It has wonderful color and an even great fragrance! I can smell this one from 20′ away! Coral Bells are usually my starting point for color inspiration as they come in some unusual colors not normally seen in the plant world. I find that there are too many containers with pastel and hum drum hues, and that I rather create a bold and striking container. I rarely keep my flowers in the pot all season. They just fizzle by the end of the summer and I get tired of them! Sometimes I have three seasons of containers – a winter one with an evergreen and some pansies and other cool weather flowers, then I move on to petunias, supertunias, cannas, lantanas -everything that likes heat, and finally to fall plants – mums, asters, grasses, cabbages, and ferns. I mix and match perennials, shrubs and annuals to get the most versatility and longevity out of my pots. 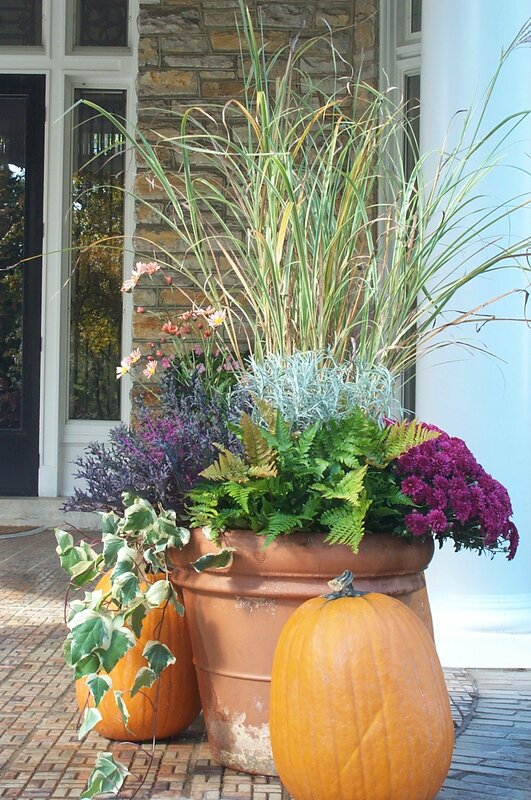 To see my post on Fall containers, go to Creative Fall containers. For early season containers, go to Seasonal Containers. Edibles in containers are big now and rightly so. So many leafy crops have gorgeous foliage and shouldn’t be relegated to the vegetable garden, and it is a great way to grow your veggies in limited space. One of my all time favorite fillers is curly parsley. Colorful kale, lettuce, spinach, and other herbs like thyme are also great. Or, you can have an entirely edible container selection, and include eggplant, tomatoes, lettuce, cucs. The sky is the limit. If it is too late to start seeds, there is a huge variety of midget sized plants available at any nursery that have been developed for container culture. Choose a large enough container to avoid constantly watering it during hot summers. A pot with a circumference of at least 15 to 18 inches is enough to get you going with a choice of different types of plants, plus enough room for them to grow throughout the summer. I like the light weight faux pots that look like real pottery, but will not crack and will retain water better than terra-cotta ones. 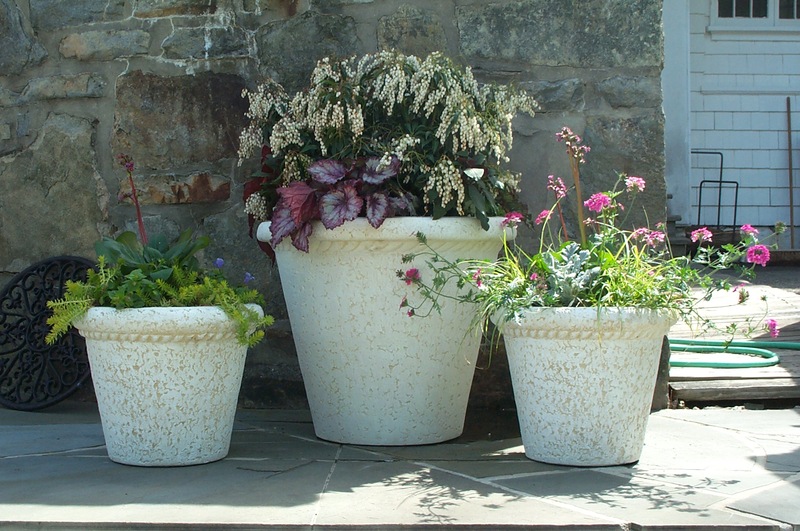 The faux pots will last for years and you can leave them out all winter, plus they are inexpensive and portable. There are even self-watering ones available which have a water reservoir built into the container. Regardless of the type of container that you have, make sure there are drainage holes in the bottom. If there aren’t any, drill some using a large bit on a portable drill and be sure to make them large enough, at least 3/4 of an inch in diameter. In addition, elevate your containers for air circulation. I use pot feet to elevate. Good soil or potting medium is critical for the health of your plants that will be sitting in the container for months or years. Use an organic mix of compost, sphagnum moss, and perlite. There are a lot of commercial potting mixes on the market so be sure to choose one that has added fertilizer to it as container plants need a good boost of fertilizer to bloom all season long, plus regular applications. Make sure that you add a good dollop of compost in the bottom of the pot – a couple of inches at least. This is where the roots are going to reach down and use up all those nutrients to produce flowers all season long. If you must reuse the same soil, then remove the top 5 or 6 inches and replace with fresh potting medium. Note if your container will be in all day sunlight, partial shade, or mostly shade. 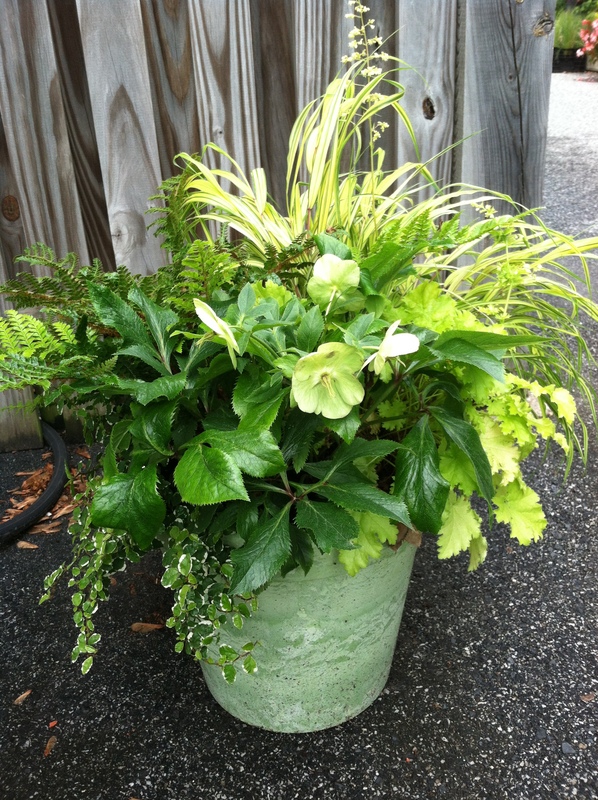 Shady container plants can be just as colorful as sunny ones with careful selection of colorful foliage. Go to the nursery and ask a knowledgeable employee for suggestions on varieties. For any situation, you want something tall for the back, like a grass, cordyline, canna or caladium, and a cascader for the edge and something to fill in between- thrillers, spillers, and fillers! It is an overused phrase, but it really describes the process well. 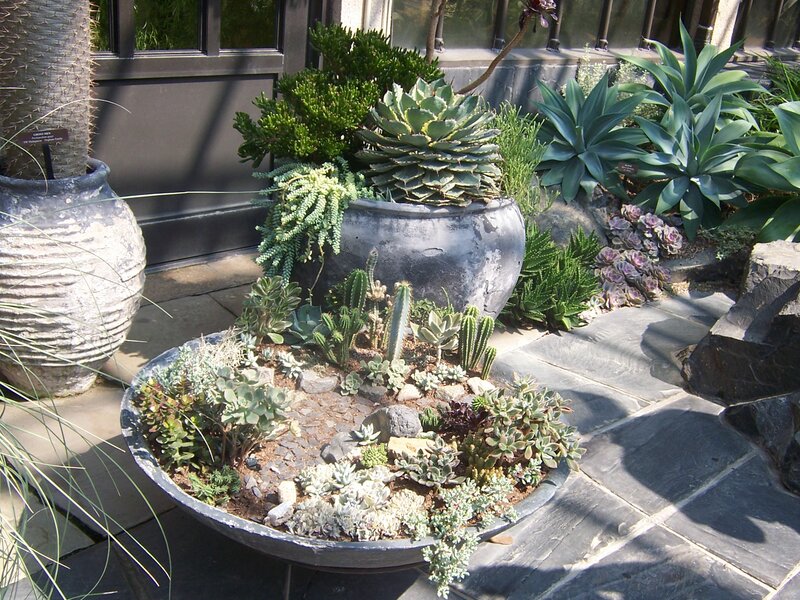 For a pot 18 inches in diameter, you would need about 5 to 9 plants. Use a tall architectural one, a couple of fillers, and a couple of spillers. 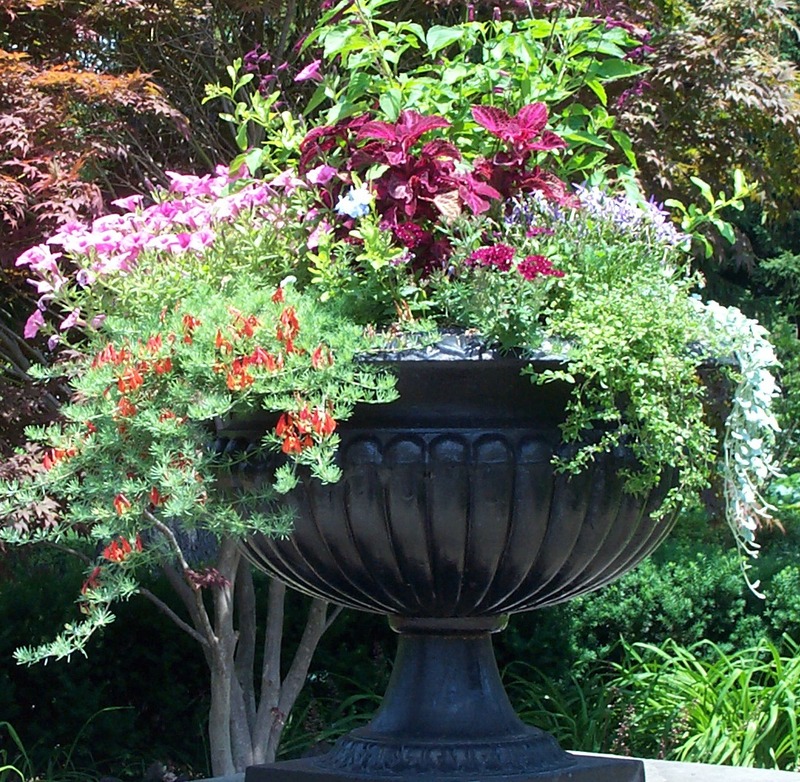 When I create a container, I want mature plants to make a big impact right away. Later on, you can prune and winnow out the ones that are failing to thrive. Planting window boxes uses the same principles as containers. To create depth you really make use of those spillers. Silver Falls, Dichondra, is a great asset for trailing down walls and planters for sun and shade, and the new begonia ‘Bonfire’ is valuable for bright color in the shade. 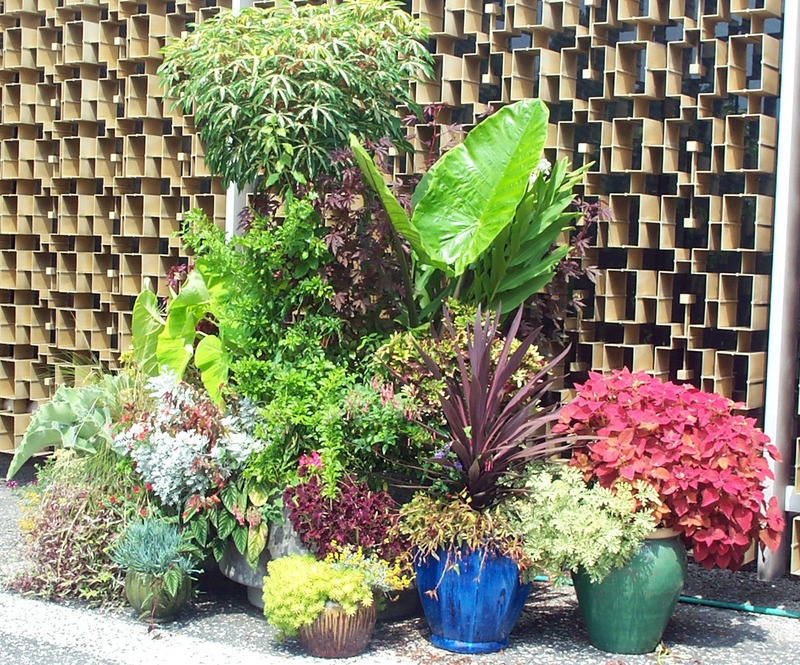 When selecting your plants, consider your textures. I see too many containers planted with flowers and foliage that are similar in texture and look too busy. Try mixing it up with some broad sculptural leaves, variegated foliage, and deeply lobed leaf shapes. Using varying forms will help your plants stand out instead of blending together in an indistinguishable mass. 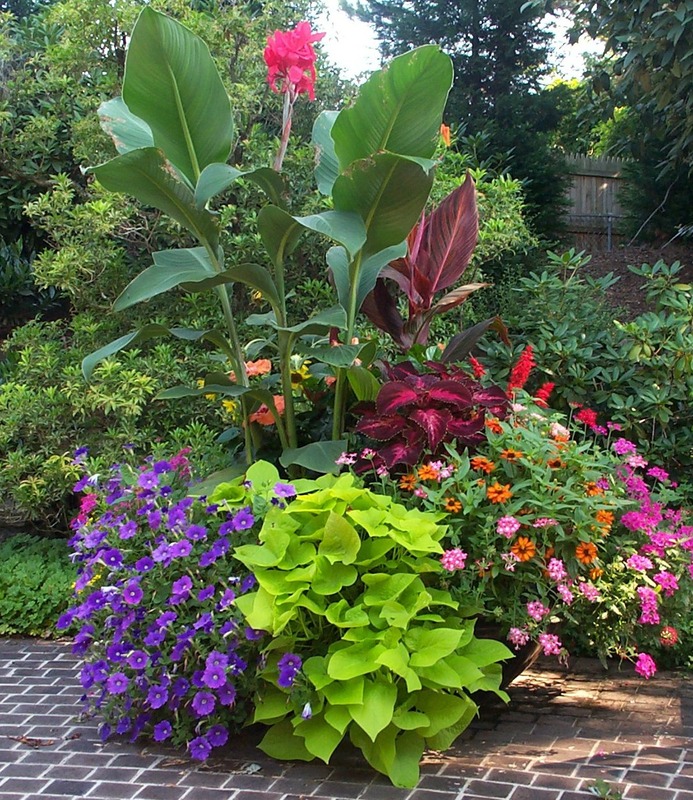 Cannas are good selections for sunny containers – just make sure your pot is large enough. I have seen cannas get 8 feet tall or higher! For shade, try Caladiums. There are beautiful Caladiums on the market with very colorful unusual markings and they will shine in the shade. But be careful when you plant these as they are very sensitive to cold. Make sure the nights keep above at least 50 degrees before setting these out. The Coleus on the market now are not your grandmother’s Coleus! Many of these new varieties are designed to thrive in full sun – not shade – though there are a few that prefer shade only. Literally, there are hundreds of varieties on the market and you could simply do lots of containers with just Coleus and have very colorful pots. 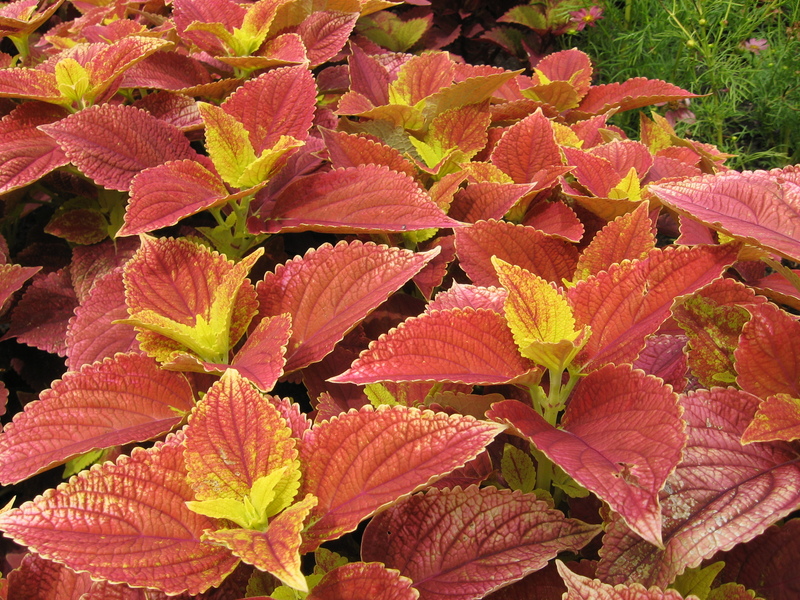 Coleus are among my all-time favorites with beautiful striking foliage. I prefer not to let Coleus flower as the flowers detract from the foliage beauty, and when they appear, I pinch them off. A beautiful Coleus – I forget the name! Maintenance includes regular watering, at least once a day when it is hot, fertilizing with a dilute or granular fertilizer at least once a week, and pinching back plants as they grow to maintain their shape. I call this nip and tuck. If you don’t do this on a regular basis, your plants will get leggy, unattractive, and woody. If you don’t have good drainage, your plants will literally drown from lack of Oxygen! 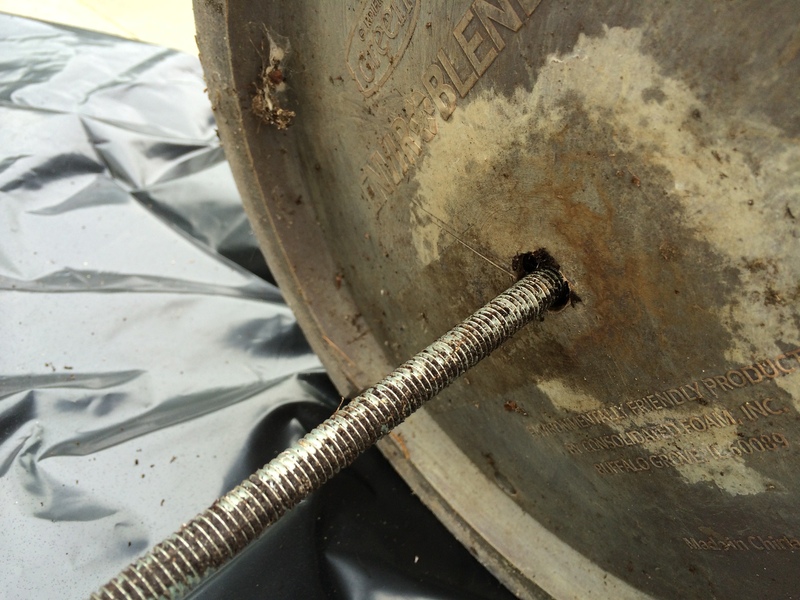 Make sure that your drainage holes are large enough so they don’t get clogged up and don’t use gravel in the bottom. I carry a long metal rod for unplugging clogged drainage holes. Added gravel just makes the pot heavier and does not help with drainage. Drip irrigation is an option if you have lots of containers that need regular watering and you don’t want to be a slave to your water can. Drip is pretty simple to set up, with all the components available at a local nursery or hardware store and they just snap together. I compare it to playing with Tinker Toys! Group your containers, especially if you have many small ones. By grouping, you achieve a bigger impact and it is far easier to take care of them in one bunch. If you do drip irrigation, grouping is essential as you use less tubing and you can hide the tubing in the adjacent pots. Grouping also makes it easier for butterflies, bees, and hummingbirds to find the nectar rich flowers. A large grouping at the National Arboretum in D.C. Attending the Mid Atlantic Nurseryman’s Show in Baltimore (MANTS) this past January is an intense glimpse into what is up and coming with the gardening industry. I took lots of pictures, trolled the aisles for new products, talked to people, and used my gardening savvy to figure out what is really brand new or recycled. Talking with Stephanie Cohen(The Perennial Diva!) she suggested to gardeners that they buy one or two of the plants that they want to try in their garden, before buying 50 of the same variety to cover an area. Only after making sure your choice of perennials are thriving, then feel free to plonk down money for more. I thoroughly agree with her! Garden conditions- drainage, soil, climate, location- are so variable that it doesn’t make sense to buy an untried perennial or shrub for your garden without first giving it a trial run. It is so easy to waste money in the nursery trade without first doing your homework and making sure that it is “right plant-right place”. There are just too many choices out there vying for your gardening dollar. Gardening trends ebb and flow like fashion crazes. “There is nothing new under the sun” could be applied to the gardening world but practices and products often are packaged and marketed differently to look new. Here are some movements that I see in the industry. Pantone’s color of the year sets the tone for 2017- “Greenery”. It wasn’t that long ago (2013) that “Emerald” was the color of the year, so green has been trendy before. Pantone’s “Greenery” looks like a lime green to me and if that doesn’t convince you that the plant world is up and coming, nothing will. Think kale smoothies, retro metal gliders, or lime green crocs that are sitting in your closet- and you have the right color in mind. Our desire to reconnect with nature? Or a symbol of revitalization? Read whatever you want into that color, I think of shimmering foliage shades for a restful experience. Monarch chrysalis is the Pantone color of the year! Gold has always been one of my favorite colors to design with and I see an uptick in golden introductions, like the one below called ‘Sunshine’. The Ligustrum leans toward the yellow end of the spectrum, the following Coral Bells are pure gold. The pace of new plant introductions has been increasing in the past five years at an exponential rate as more and more people are gardening and want more choices- namely dwarf plants. Virtually every full size plant has a newer dwarf variety that is at least half the size with as many or more flowers than the full size version. Neat and tidy is the name of the game and with so many dwarf introductions, it is hard to keep track of them. The plant industry is working hard on plants that fit into our downsized lifestyle and gardens. Plus, plants that normally bloom only once-like Azaleas, are reworked to bloom again and again so that we get a longer season of enjoyment. I was glad to see Proven Winner’s ‘Vista Bubblegum’ receive the accolade of Annual of the Year for 2017. Using this plant for at least 10 years and marveling at the toughness and beautiful form and color, I thought I was the only one who noticed! This is one plant that I make sure I buy enough for my containers and window boxes, as well as the landscape and can’t get enough of. A deserved recognition, I hope that it will now be easier to find. Greens,beautiful greens! Dinosaur kale, collards, swiss chard, lettuce, arugula, spinach, mustard greens, carrot tops; you name it, someone is eating it and/or growing it! Chock full of good nutrients and easy to grow in the garden or in containers, greens are here to stay. And not just greens. Veganism is mainstream. No longer a niche group, vegan consumers desire a cleaner product, want to lose weight, and are environmentally conscious. Even if you aren’t a total vegan, people are incorporating more vegetables in their diet. My last trend report for 2016, Top 10 Garden Trends for 2016, included the cauliflower as the trendiest vegetable in the garden. I see it at the supermarket in pizza crusts, brownies, salads, and as a rice. As easy to grow as tomatoes, but more prone to pests, here is a guide to growing – Growing Cauliflower in Containers. Millennials especially are embracing this trend of eating and growing healthy in portable containers. Berry bushes, like the new Bushel and Berry series of berry bushes- dwarf blueberries, blackberries, and raspberries are appearing on decks and patios. As one of the Superfoods that everyone should include in your diet, people are incorporating these dwarf heavy bearing shrubs into their gardens and containers. I am trialing ‘Strawberry Shortcake’ Raspberry and looking for the ‘Perpetua’ Blueberry (2 harvests a year!) and Blackberry ‘Baby Cakes’ and will be reporting on how well they do this year. Again, black or dark foliaged plants are in the forefront and they contrast nicely with the limey green ‘Greenery’. Check out my post Black Goes With Everything. Heucheras or Coral Bells come in an array of dark hues, like the ones below called ‘Silver Gumdrop’ and ‘Black Pearl’ from Walters Gardens. Remember the tired looked Shefflarias and Spider Plants from the 70’s? If you look at pictures from that era, houseplants were everywhere, perched on harvest gold counter tops or dangling from macrame hangers. The nostalgia and the plants are back! But instead, clustering succulents in a retro glass container or air plants being thrown together in a wooden trough with glass balls are appearing. Orchids, especially Vandas are mainstream and hanging from the ceiling of your sun room. Bromeliads are coming back with some crazy colors. Another current use of house plants is to counter indoor pollution, one more way that Millenials are trying to control their environment for healthy living. Succulents are still huge trend setters with their jewel like rosettes of beautiful foliage. Cacti are joining right in.Easy care plants that are small and portable and take neglect, you see them in hanging baskets, wreaths, trees, and, wedding bouquets, and containers. A crafty plant, go to my post Succulents For the Fall or Deck the Halls-A Succulent Christmas. Destination nurseries are getting more numerous and more sophisticated than ever. Prolific on the west coast and the United Kingdom, they are trickling into the rest of the country. After my recent trip to Scotland when I visited several garden centers, I realized that the U.S. has some catching up to do. Dobbies is a destination garden center/nursery that has its headquarters outside Edinburgh and bills itself as a leisure destination for all the family. I have posted about a few destination garden centers, namely Surreybrook-A Destination Garden Center located in Maryland, Annie’s Annuals in Richmond, California, and Grubb Heaven in San Francisco. Including restaurants and lifestyle products, these destination garden centers are more than just a place to shop for plants. Marketing of plants has hit big time. 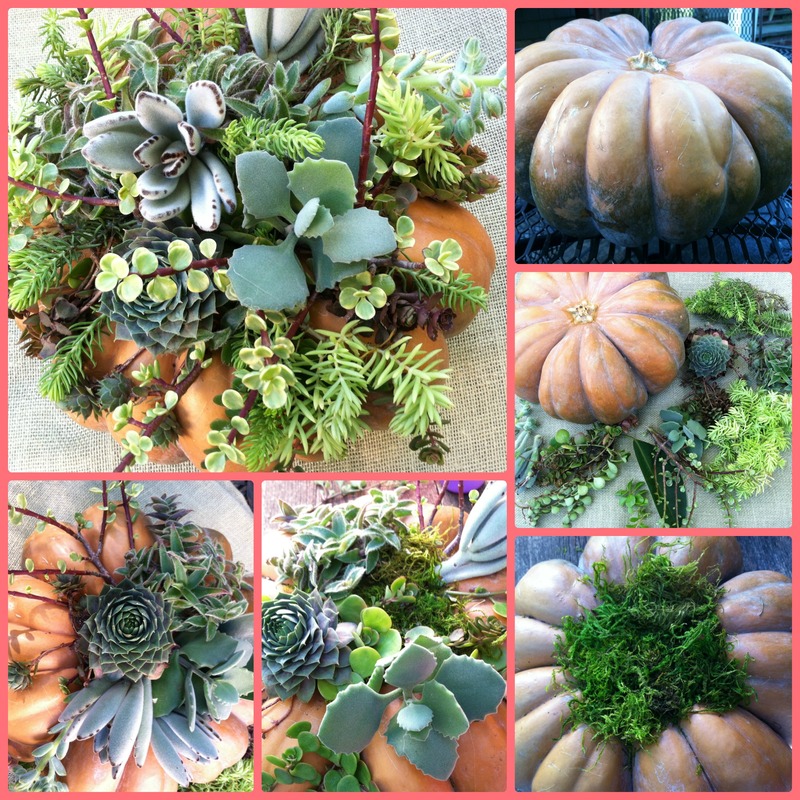 Pumpkins and succulents-a happy pairing! With some glue, moss, succulent cuttings, and an interesting pumpkin, you can create porch decor or a great centerpiece in minutes. These last for months too. And if you have any extra flowers available, you can stick them in to get a quick color burst for a party or event. Find a wide topped pumpkin and cut the stem off; I used “Cinderella” variety which has a grayish orange color, deep pleats, and a wide roomy top. For my other example, I used a “peanut pumpkin”(see note below). I think a white or green pumpkin would look fabulous. Also, gourds would be funky too. Glue moss on top about 1/2 inch thick with a glue gun or tacky glue. Arrange your succulent cuttings to form a pleasing arranging, making sure that you use the larger chunkier pieces first, and using long pieces to trail around the edges. Stick the stems into the moss with glue so that they adhere. A hot glue gun works best for this. 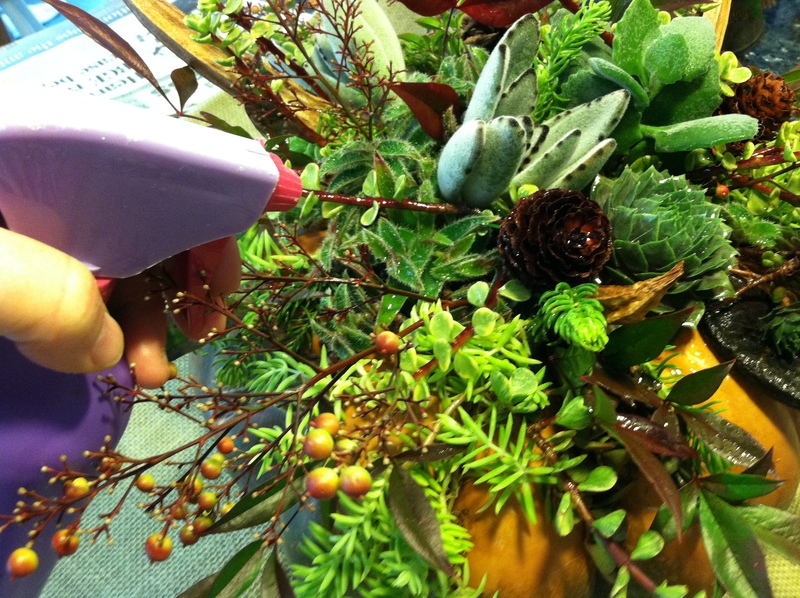 Add berries, pods, or anything else that goes with the fall theme, gluing in place. Spritz the moss so that it is moist. Peanut pumpkin (Cucurbita maxima ‘Galeux d’Eysine’) is an heirloom pumpkin known for its distinctive peanut-like growths adorning the exterior of its pink hued rind. The “peanuts” are actually a buildup of excess sugar in the flesh of the pumpkin giving it its unique texture. Those warty protuberances tell you the flesh is extra sweet for making pies and other dishes. See some other varieties of pumpkins at Pumpkin Eye Candy. It is best to keep the pumpkin outside in the chilly weather when you don’t want to show it off. I keep the decorated pumpkin out during the week on my front porch under cover, and bring it in on the weekends when we are around the house more. Pumpkins need cold weather to stay firm through the season. A warm house will speed up the inevitable decomposition and I want mine to last through Thanksgiving. Sometimes the succulent cuttings even root in the moss and you have more succulents to pot up. 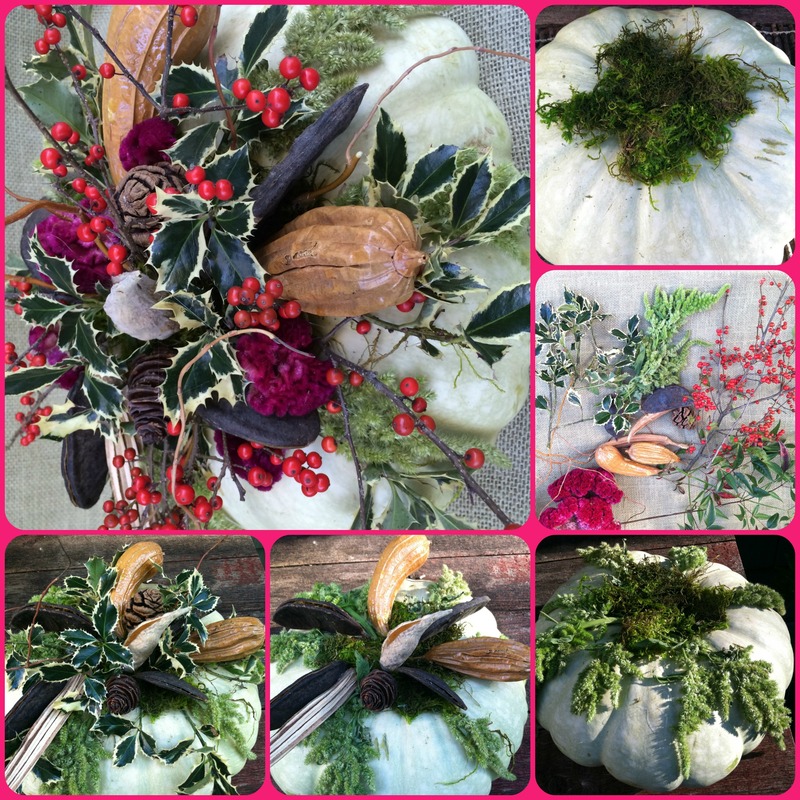 For more centerpiece ideas, go to Centerpiece Ideas for Thanksgiving. 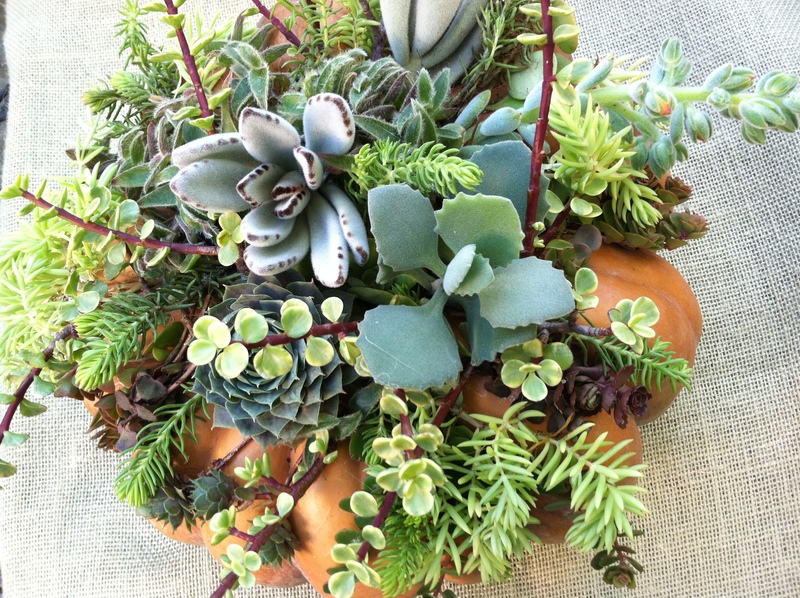 Who would ever have thought of decorating pumpkins with succulents? Like bacon, succulents go with everything and make it better. The finished product is so different from the traditional carved Jack-O-Lantern, plus you don’t have to fool with the mess of seeds and rotten pumpkins. Unlike cut pumpkins these will last for months, and the succulents actually root in the moss if misted occasionally. This is a great new twist on decorating pumpkins for the fall holidays that is easy, no mess, and so creative. In the fall I have so many large succulents that I don’t have room for inside that I cut them up for decorations. Better than losing the succulents to frost! The succulents actually root into the moss and you can transplant the cuttings to soil and grow them and set them out in the spring, saving on your start-up plant costs. Little pumpkins on top of big pumpkins! Assorted cuttings of succulents. I was moving most of my succulents indoors to beat the frost, and this gave me the opportunity to trim the growth back or actually uproot an entire plant, washing off the roots. I simply nipped large pieces of succulent tips from living plants, trying to vary colors, shapes, and textures. Assorted pods, i.e. pine cones, okra pods, lotus pods, milk weed pods, and berries. 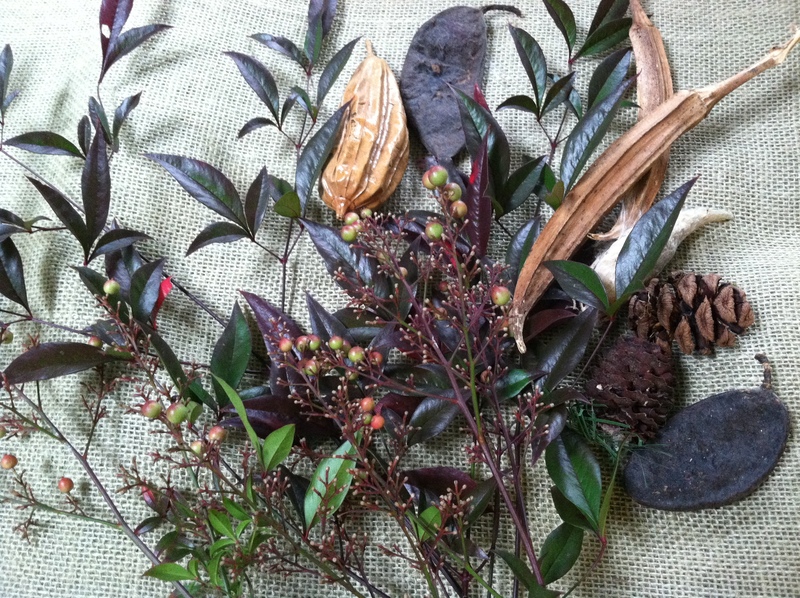 For my example above, I used nandina berries and foliage which dries quite nicely, and okra pods. Mix it up with whatever you have on hand. Find a wide topped pumpkin and cut the stem off; I used “Cinderella” variety which has a grayish orange color, deep pleats or grooves, and a wide roomy top. Arrange your succulent cuttings to form a pleasing arrangement, making sure that you use the larger chunkier pieces first. Stick the stems into the moss with glue so that they adhere. 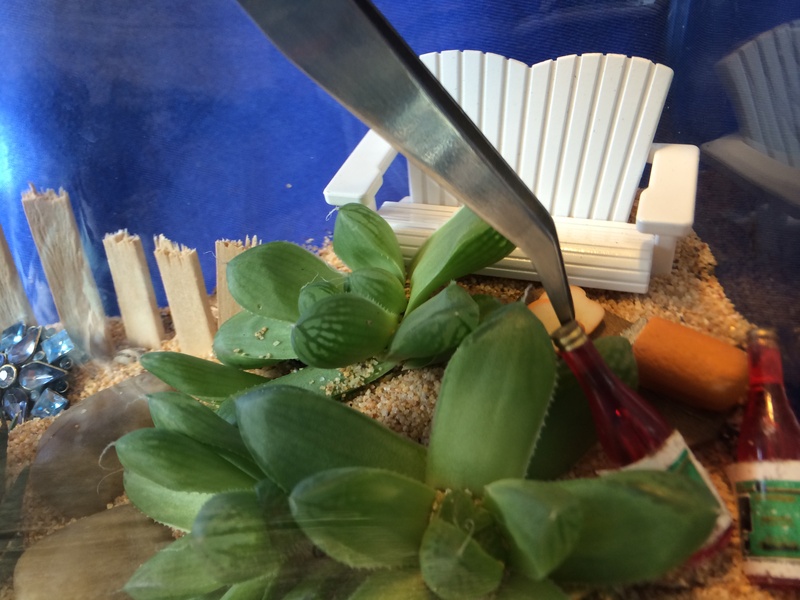 Glue will not hurt the succulents. 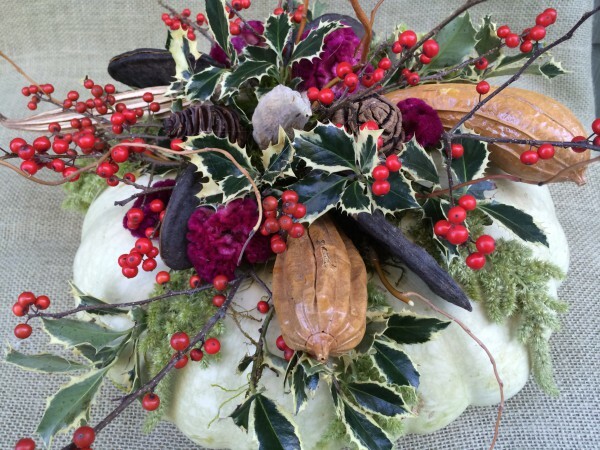 There are so many unusual pumpkins on the market today that I also tried this arrangement with a Christmas theme using a white pumpkin, adding fresh variegated holly, winterberry, green amaranthus, and dried burgundy cockscomb to add a nice contrast to the white pumpkin. Gourds are also a great choice for these arrangements, appropriate for Thanksgiving and I chose a tall narrow one that fits into a smaller space. I had gathered some orange rose hips on the side of the road and blackberry lily berries and knew I had found the perfect use for them decorating the top of my gourd. It is best to keep the pumpkin inside in a cool spot, out of direct sunlight. Pumpkins need cool weather to stay firm through the season. If you want to keep them in an outside location, like mine on my front porch, be sure to bring inside when the weather turns colder with hard freezes. A warm house will speed up the inevitable decomposition, so don’t put your pumpkin on top of a radiator or in a sunny window. Last year, my pumpkins lasted into January! I don’t need to read tea leaves or get out my crystal ball to figure out what is bubbling up in the horticulture world for 2015. Traveling to lots of nurseryman’s and flower shows, cutting edge gardens, and keeping up with my blog, gives me a good handle on what is up and coming in the gardening world. Some of these are trends have been around and are still going strong, while others are just getting a foothold, like smoking or drinking your garden! Or one of my personal favs, Orange is the New Black! For a read on the 2014 trends, go to Top 12 Garden Trends For 2014. What was trending a year ago still is gathering steam, like grafted vegetables, especially tomatoes. I grew 3 grafted tomatoes last season and I need to grow some more to say for sure if the extra work (grafting when young) and expense is worth it. 1. Native Pollinators-Pollinator gardens are still going strong for native pollinators such as mason bees, honeybees, and butterflies. But in keeping with back to nature gardening, people are thinking about plants that sustain pollinators as well as birds, so we are looking for and planting multi-use/season plants. The newest wrinkle is creating a monarch way station to feed the monarchs on their long migration. Go to Monarch Way Station to see how to set your own up. 2. Bambi Proof– With the skyrocketing growth of deer and the distress of seeing your hard-earned cash become salad, people are demanding low maintenance deer resistant plants. See my Deer Combat post for strategies on planting for deer, and What is Deer Resistant, Blooms in the Winter, and is Evergreen? for the ultimate deer proof plant – Hellebores. 3. New Cultivars- The pace of new cultivar releases increases every year so that I can’t keep up with all the new varieties rolling off the plant benches. But think colorful foliage plants, dwarf plants, and new varieties of old fashioneds on steroids like the new gomphrena ‘Pink Zazzle Gomphrena’. Plant breeders are looking to amp up the size and color of flowers to appeal to consumers. Oodles of color and larger flowers, are the order of the day. 4. Food in Jars- Definitely, not your grandma’s canning! Preserving food in small designer batches like chutney and tomato jam, make growing veggies fun and creative. Go to my post All Jammed Up! Easy Tomato Jam to make a delicious chocolate-laced jam. People are having a new kind of party-preserving ones! I know because I have had several, like Jam Session for strawberry jam. 5. PPA-Geranium ‘Biokovo’- Finally a perennial Geranium made this coveted list, the Perennial Plant Association Plant of the Year. Geraniums are the unsung heroes of the perennial world – tough, attractive during most of the season, long-lived, and an underused deer-proof ground cover. Not a glamorous plant by any means, but I would not be without these workhorses. See Choosing the Right Ground Cover For Shade for more examples of under-used ground covers. 6. Eco-Chic/Homesteading- Raising bees, chickens, rabbits, and goats has gotten quite trendy. As an off-shoot you can make your own soap, body cream, and cheese even! Go to my post Beekeeping Start-Up, How to Jump Into the World of Beekeeping, and Beekeeping 101 to see if this is something you are dying to try. My post Honey Scented Body Butter is one of my top five post for hits. Go figure…. Growing your own food organically still tops the list of most gardeners and is intimidating to newbies. Start small, take it slow, and don’t bite off more than you can chew, is the best advice I can give. As you grow more confident and are successful with a small garden, move on to larger projects. Talk to any gardener in August, and they will wish that they didn’t have such a large garden to weed and water! Many people are buying organic veggies at the local farmer’s market if they don’t have access to space for a garden, or alternatively growing edibles in containers. 7. Slow/Thoughtful Gardening-Growing plants that need less water, are more pest resistant and better for the environment just got pushed up the garden trend list. People are becoming more responsible in plant selections, educating themselves about the varieties before going to the nursery, or looking it up on their smart phone while at the nursery. There are tons of plants that don’t have pot appeal in the spring when most people visit the nursery, that languish on the benches. Instead these plants should be jumping in the cart, because they are a better choice than a spring fling plant. Good examples are fall blooming perennials like Monkshood-Deadly Blue Beauty or Autumn All-Stars. 8. Growing Super Foods/Edibles-The ever-increasing interest and use of edibles in containers and in the garden is still up there. Think berries, fruit, and lots of kale(dinosaur, preferably). Okra is another super food that is coming into its own. Go to Okra-Superfood Superstar for more information. The only problem for me is that I don’t like okra! So many people don’t have the time or space to devote to a large vegetable growing operation, but when the edibles are contained and automatically watered, it becomes doable. 8.Water Friendly Gardening- I know, I know, this has gotten a little long in the tooth in gardening worlds. But really, as a landscape designer, water friendly gardening besides deer proof plants, is the number one request. Rain barrels, rain gardens, and using natives that use less water are high on client’s wish lists. See Rain Barrel Eye Candy. 9. Cool Nurseries-Nurseries are becoming a destination, not just a place to buy tomato plants. Look at Flora Grubb (yes, that is her name!) at Grubb Heaven in San Francisco who says “My goal is always to provide a fascinating encounter with the natural world”. It is not just a gardening store, it is an experience. See Annie’s Annuals and Escape to Surreybrooke, for more destination nursery adventures. 10. 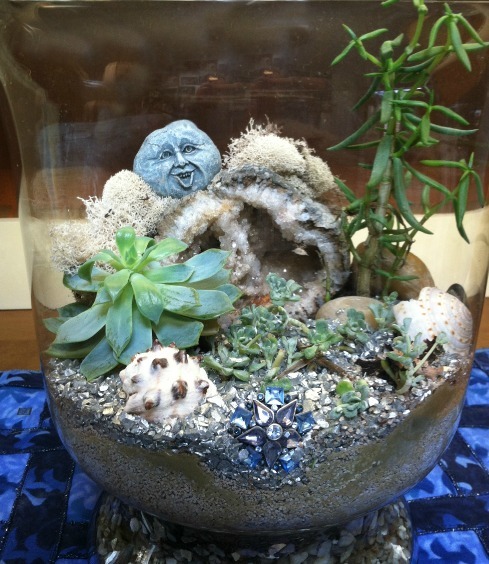 Sedum/Succulent Mania-It has just begun; Look for colorful fantastic shapes and new ways of using them. 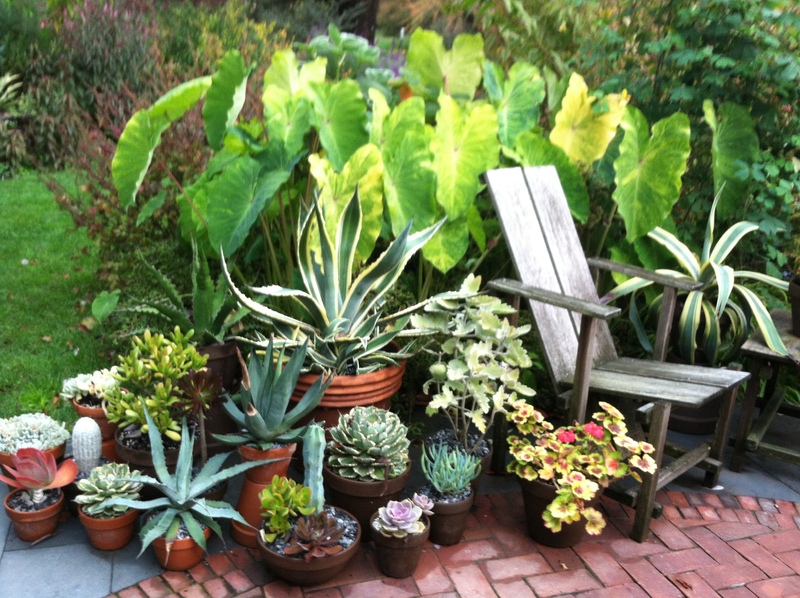 Succulents are tough, can take abuse and neglect, and come in a dazzling array of shapes and textures. 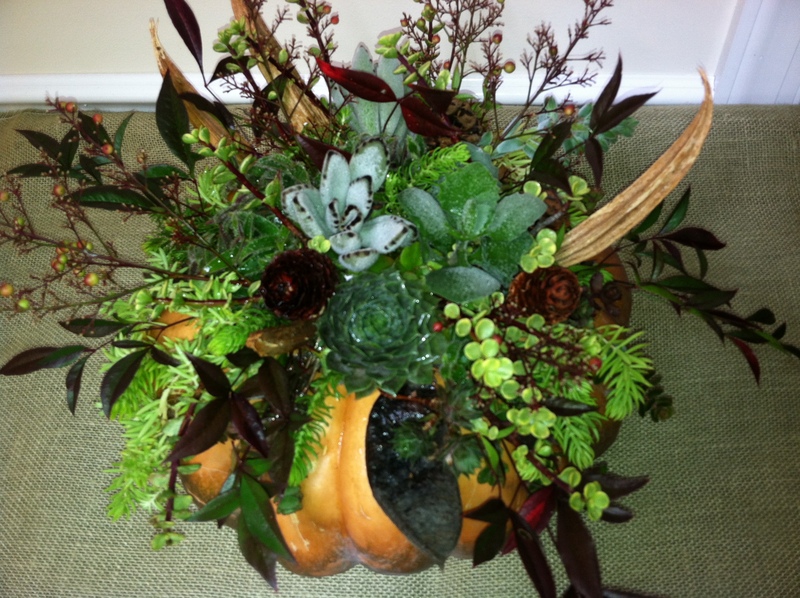 See Succulent Creations for ideas. 11. 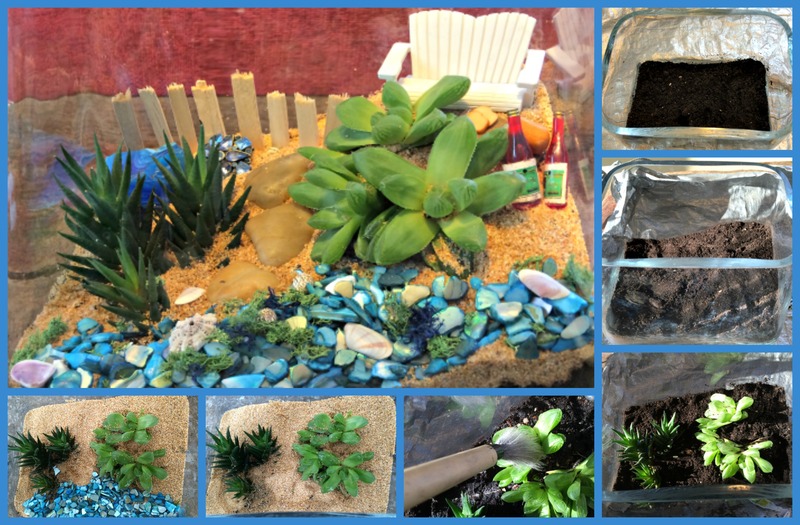 Small is Big- Miniature/Fairy Gardening–Predicted by many to have run its course, this is still running strong with smaller versions (terrarium sized) of regular sized plants. My most popular blog by far is still Home For A Gnome. When I posted this, I was getting more than 2000 hits on my blog a day, where normally I get around 200. I will be doing a fairy/miniature gardening demo at the Philadelphia Flower Show this March, so people are still enthralled with the miniature idea. 12. Drink and Smoke Your Garden-Growing your own organic herbs to muddle in a drink, or adding a sprig of lemon thyme in a drink, or making tea from culinary herbs is all the rage. But I am seeing another related trend just beginning and gathering a little steam, and that is growing marijuana. With the decriminalization of weed in many states, growing your own is not far behind. Growing is legal with the recent passage of Amendment 64 in Colorado, where you can cultivate up to 6 plants per adult in your home. Just think of the grow lights and plants that will be flying off the nursery shelves when this hits! 13. Repurposing/Old Meets New-Personal style is reflected on how you design and decorate your outdoor spaces. Whether it is a bottle tree that you created or pallets repurposed to build outdoor furniture or containers, this is both an interior and exterior trend. When I visited Portland this summer and toured some cutting edge gardens, the frequent use of orange flowers and accessories struck me. Black plants used to be the “in” flower and foliage color, see 50 Shades of Black, but I think orange has overtaken black for the hottest shade. Maybe it hasn’t hit the east coast yet, but we are always behind the trendy west coast. See Orange is the New Black post to see how orange has come a long way. I create containers for clients all the time and am always looking for inspiration to move away from the “geraniums with spike and trailer” school of thought. With a little more planning and shopping, you can come up with a showplace masterpiece with WOW impact. Check out my updated post Containers With Pizzazz for new pictures and ideas. And for containers geared to attract pollinators, look at Nectar in a Pot-Movable Feast. The best piece of advice that I picked up over the years was a secret to coordinating your colors in an arrangement. Choose a piece of fabric or piece of art that you really like, and take it with you when you plant shop. Of course, you can’t take a painting with you so grab refrigerator magnets with famous paintings on them from museums, cut a swatch from fabric, or cut out paintings from magazines. Inspired by a Van Gogh, my most successful container used the colors from his iris painting. Van Gogh’s painting has that intense blue which so many people adore – also orange, greens, a touch of white and yellow. If you like it in a painting, you will like it in a container! I have plenty of room to plant in my beds but I really enjoy planting in containers because they become a piece of art in miniature. This is my opportunity to try new annuals untested by me, and go wild with the color combos. Bold, vibrant, and sizzling color, is the driving force for many of my combinations. Browse the new Pantone colors for 2016, and you will see a mix of Rose Quartz and Serenity(light blue) the top colors for this year. Not my cup of tea, as I prefer Violet Tulip, Radiant Orchid, Dazzling Blue, Celosia Orange, Freesia Yellow, and Cayenne which were the colors of the past couple years. I find that there are too many containers with pastel and hum drum hues, and that I enjoy creating a bold and striking container . Musical Plants-Rearrange for the Season! I rarely keep my flowers in the pot all season. They just fizzle by the end of the summer and I get tired of them! Sometimes I have three seasons of containers – a winter one with an evergreen and some pansies and other cool weather flowers, then I move on to petunias, supertunias, cannas, lantanas -everything that likes heat, and finally to fall plants – mums, asters, grasses, cabbages, and ferns. I mix and match perennials, shrubs and annuals to get the most versatility and longevity out of my pots. 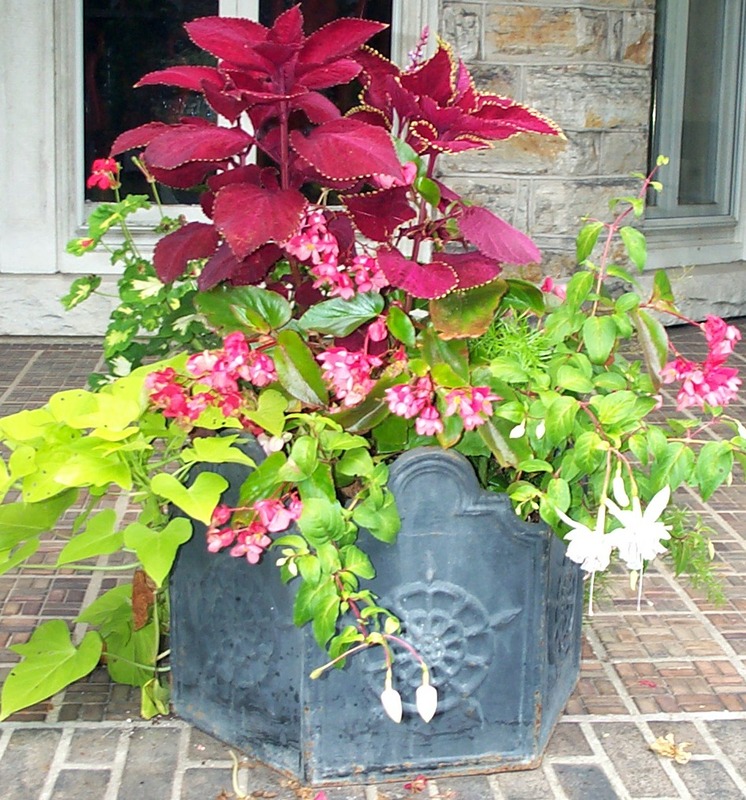 To see my post on Fall containers, go to Creative Fall containers. For early spring containers, look at Seasonal Containers. Edibles in containers are big now and rightly so. So many leafy crops have gorgeous foliage and should be used more in containers and is a great way to grow your veggies in limited space. One of my all time favorite fillers is curly parsley! I buy this by the flat full. Colorful kale, lettuce, spinach, and other herbs like thyme are also great. Or, you can have an entirely edible container selection, and include eggplant, tomatoes, lettuce, cucs. The sky is the limit. If it is too late to start seeds, there is a huge variety of midget sized plants available at any nursery developed for container culture. Choose a large enough container to avoid constantly watering it during hot summers. A pot with a circumference of at least 15 to 18 inches is enough to get you going with a choice of different types of plants, plus enough room for them to grow throughout the summer. I like the light weight faux pots that look like real pottery, but will not crack and will retain water better than terra-cotta ones. Faux pots will last for years and you can leave them out all winter, plus they are inexpensive and portable. There are even self-watering ones available which have a water reservoir built into the container. Regardless of the type of container that you have, make sure there are drainage holes in the bottom. If there aren’t any, drill some using a large bit on a portable drill and be sure to make them large enough, at least 3/4 of an inch in diameter. It is an overused phrase, but it really describes the process well. For a pot 18 inches in diameter, you would need about 5 to 10 plants. Of the selected plants, use a tall architectural one, a couple of fillers, and a couple of spillers. Be wary of stuffing too much in so that plants have room to grow. Or for instant impact, stuff away and you can edit as plants get larger. Planting window boxes uses the same principles as containers. To create depth you really make use of those spillers. Silver Falls, Dichondra, is a great asset for trailing down walls and planters for sun and shade, and the new begonia ‘Bonfire’ is valuable for bright color in the shade . Maintenance includes regular watering, at least once a day when it is hot, fertilizing with a dilute or granular fertilizer at least once a week, and pinching back plants as they grow to maintain their shape. I call this nip and tuck. If you don’t do this on a regular basis, your plants will get leggy, unattractive, and woody. It is also a good idea to elevate containers on bricks or “pot feet” so that they drain properly. If you don’t have good drainage, your plants will literally drown from lack of Oxygen! Make sure that your drainage holes are large enough so they don’t get clogged up and don’t use gravel in the bottom. I carry a long metal rod for unplugging root mass clogged drainage holes. Group your containers, especially if you have many small ones. By grouping, you achieve a bigger impact and it is far easier to take care of them in one bunch. If you do drip irrigation, grouping is essential as you use less tubing and you can hide the tubing in the adjacent pots. Also, if you are doing pollinator friendly pots, grouping them makes it easier for butterflies, bees, and hummingbirds to find them. 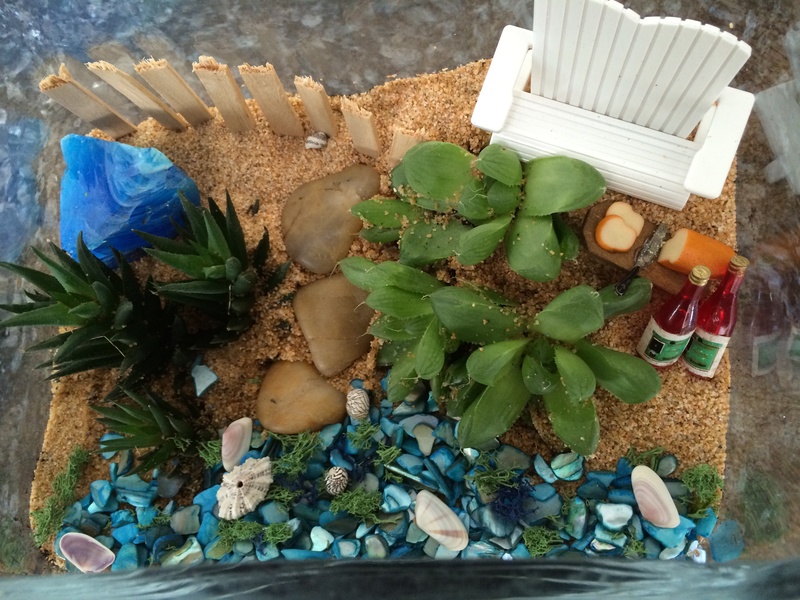 If you crave the seaside atmosphere in the middle of winter, create a beach scene in miniature! Succulents are some of the easiest plants in the universe to grow and anyone can put this together to brighten up the dark days of winter. Set in a sunny window and enjoy! If you like this blog, please take a minute and nominate my blog for the first Annual bloggers award at Better Homes and Gardens at http://www.bhg.com/blogs/better-homes-and-gardens-style-blog/bhg-blogger-awards/ Many thanks!! Anyone with a flower pot can put together a container in an afternoon with a trip to the local big box store or nursery. 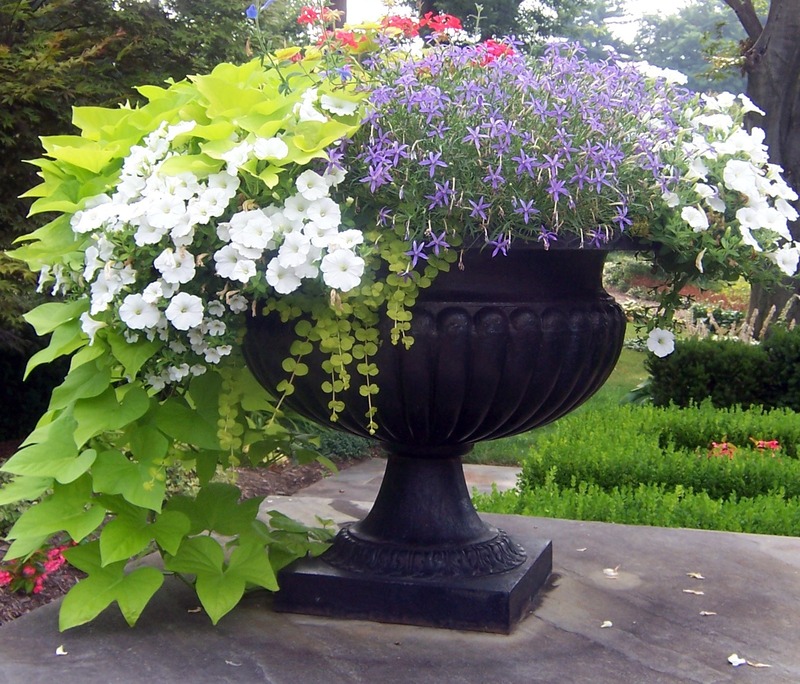 But here are a few pointers which help with the final result that will turn your finshed product from the pedestrian geranium with vinca vine to a showplace masterpiece with Wow factor. The best piece of advice that I picked up over the years was the secret to coordinating your colors in a container. Choose a piece of fabric or piece of art that you really like and take it with you when you plant shop. Of course, you can’t take a painting with you so grab refrigerator magnets with famous paintings on them from museums, or cut out paintings from magazines. My most successful container was inspired from a Van Gogh magnet obtained from my many museum visits. 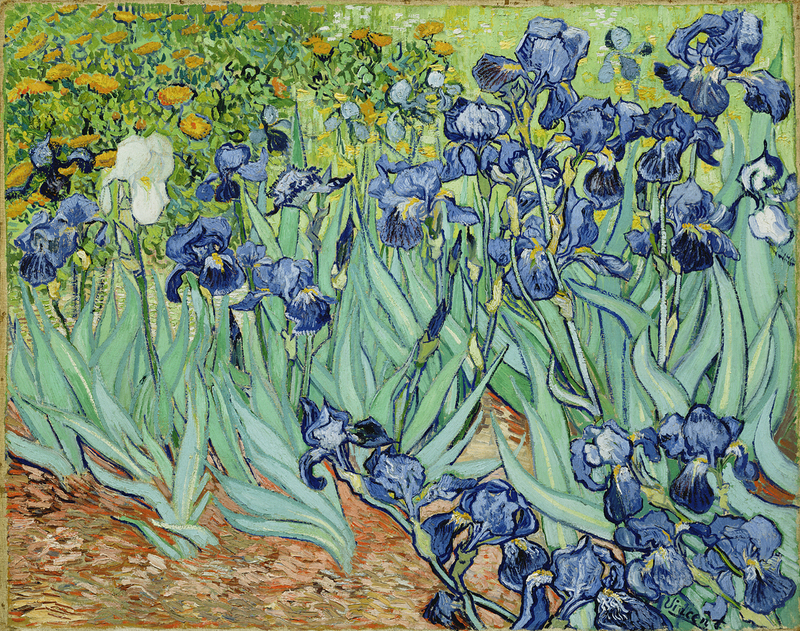 Van Gogh’s iris painting has that intense blue which is hard to get with flowers – also orange, greens, a touch of white and yellow. If you like it in a painting, you will like it in a container! I have plenty of room to plant in my beds but I really enjoy planting in containers because they become a piece of art in miniature. This is my opportunity to try new annuals that look good in the nursery and go wild with the color combos. I also do it professionally for clients who don’t have the time or expertise to put it all together. I rarely keep my flowers in the pot all season. They just fizzle by the end of the summer and I get tired of them. Sometimes I have three seasons of containers – a winter one with an evergreen and some pansies, then I move on to petunias, supertunias, cannas, lantanas -everything that likes heat, and finally to fall plants – mums, asters, grasses, cabbages, and ferns. I mix and match perennials, shrubs and annuals to get the most versatility and longevity out of my pots. Choose a large enough container to avoid constantly watering it during our hot Maryland summers. A pot with a circumference of at least 15 to 18 inches is enough to get you going with a selection of different types of plants, plus enough room for them to grow throughout the summer. I like the light faux pots that look like real pottery, but will not crack and will retain water better than terra cotta ones. These faux pots will last for years and you can leave them out all winter, plus they are inexpensive and portable. There are even self-watering ones available which have a water reservoir built into the container. Regardless of the type of container that you have, make sure there are drainage holes in the bottom. If there aren’t any, drill some using a large bit on a portable drill. The soil that you use should be an organic mix of compost, spaghnum moss, and perlite. There are a lot of commercial potting mixes on the market so be sure to choose one that has added fertilizer to it as container plants need a good boost of fertilizer to bloom all season long, plus regular applications. Make sure that you add a good dollop of compost in the bottom of the pot – a couple of inches at least. This is where the roots are going to reach down and use up all those nutrients to produce flowers all season long. Consider where the container will be located when you select your plants. Notice if the site will get all day or part-day sunlight, or will be in mostly shade. 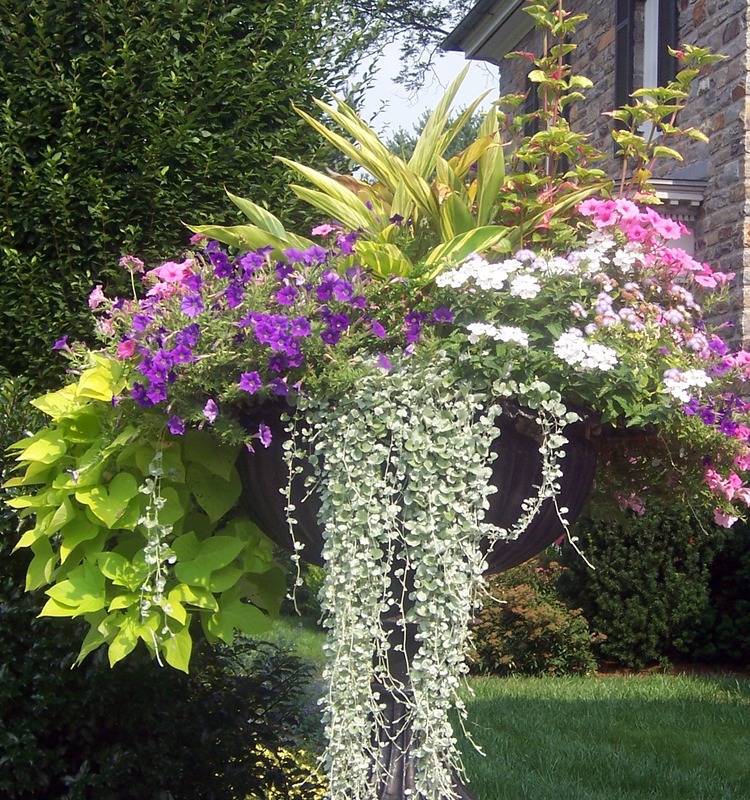 Shady container plants can be just as colorful as sunny ones with careful selection of colorful foliage. Go to the nursery and ask a knowledgeable employee for suggestions on varieties. For any situation, you want something tall for the back, like a grass or Canna or Caladium, something shorter for the middle area, and a spiller to cascade down the sides – thrillers, fillers, and spillers! – I am sure everyone has heard this phrase. It is an overused hackneyed phrase, but it really describes the process well. 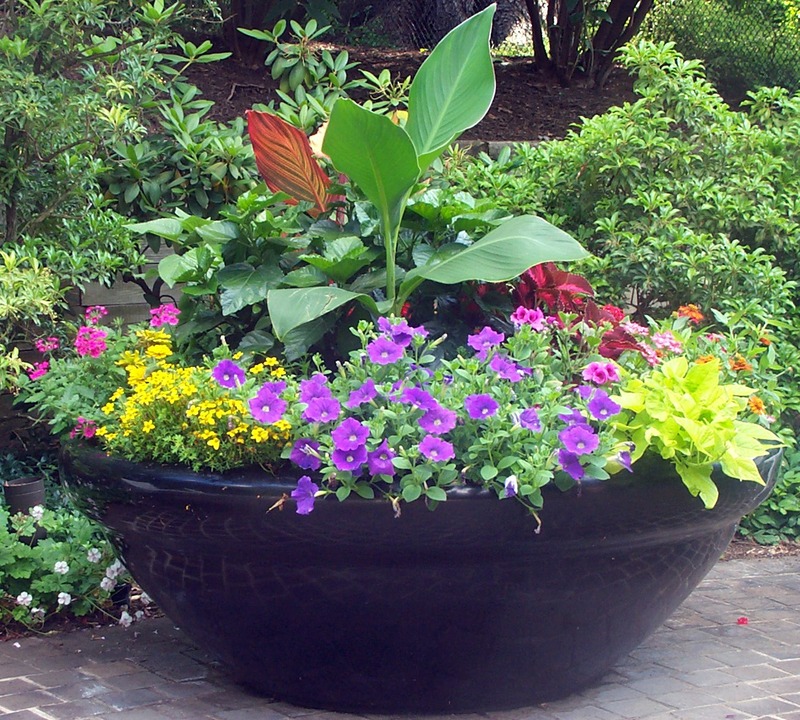 For a pot 18 inches in diameter, you would need approximately 5 to 6 plants. Of the 5 plants, use a tall architectural one, a couple of fillers, and a couple of spillers. 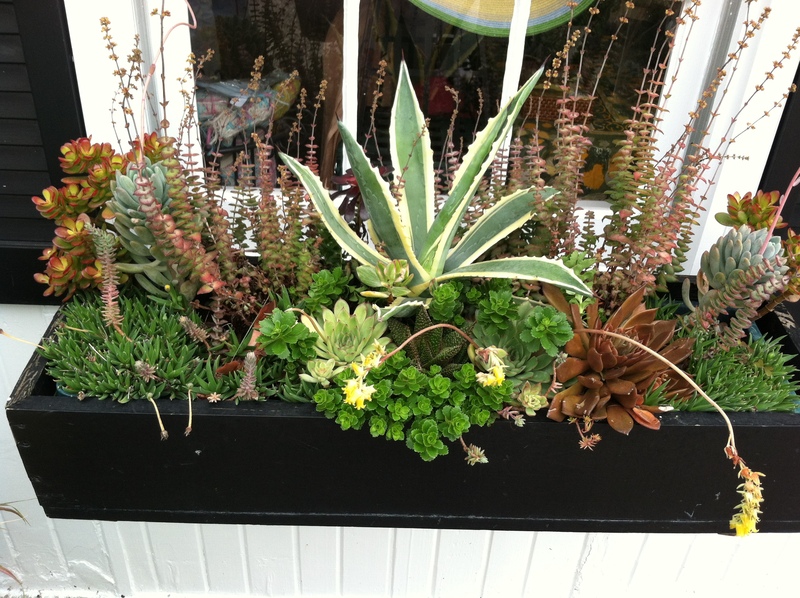 Window boxes are planted using the same principles as containers. To create depth you really make use of those spillers. 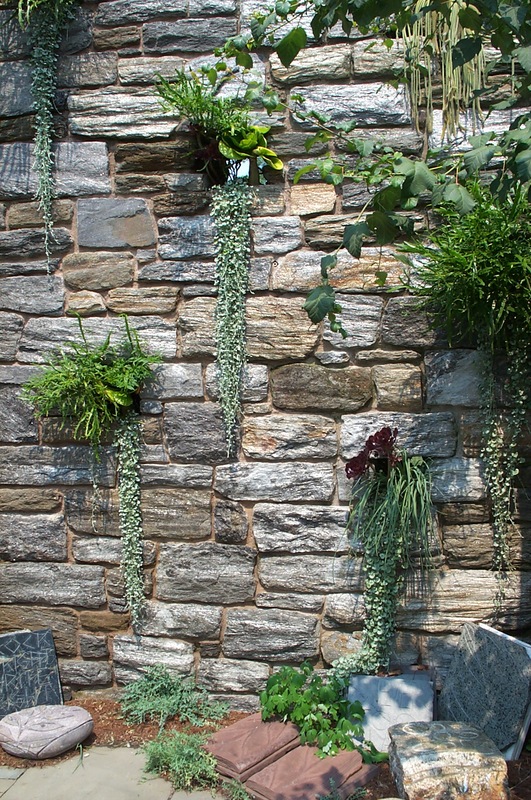 Silver Falls, Dichondra, is a great asset for trailing down walls and planters. Whe selecting your plants, consider your textures. I see too many containers planted with flowers and foliage that are similar in texture and look too busy. 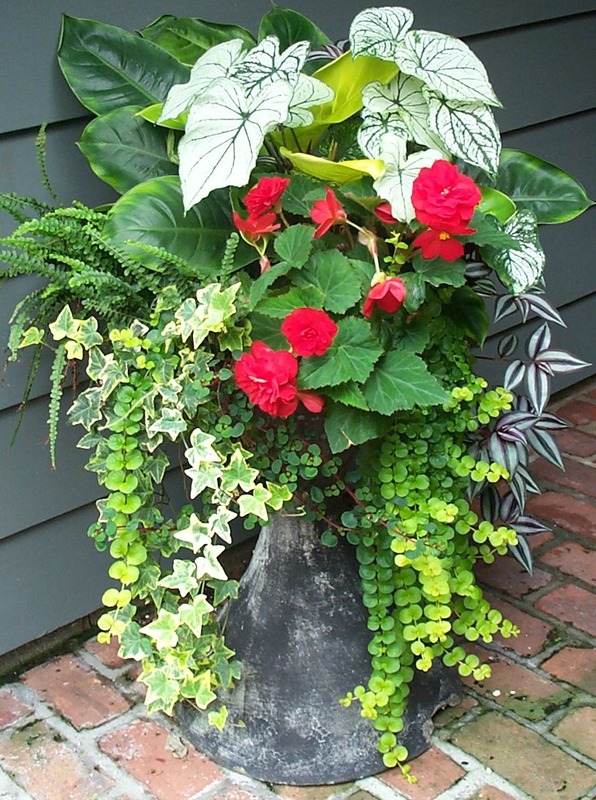 Try mixing it up with some broad sculptural leaves, variegated foliage, and deeply lobed leaf shapes. Using varying forms will help your plants stand out instead of blending together in an indistinguishable mass. 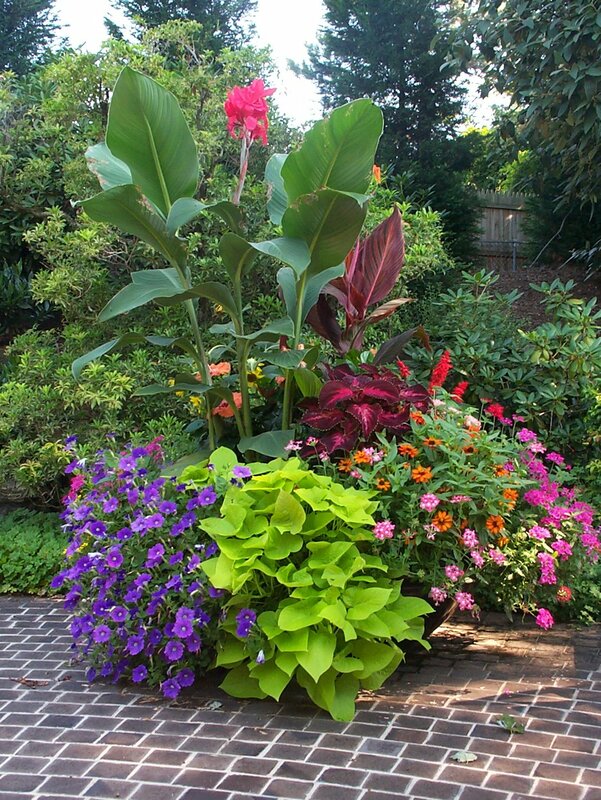 Cannas are good selections for sunny containers – just make sure your pot is large enough. I have seen cannas get 8 feet tall or higher! For shade, try Caladiums. 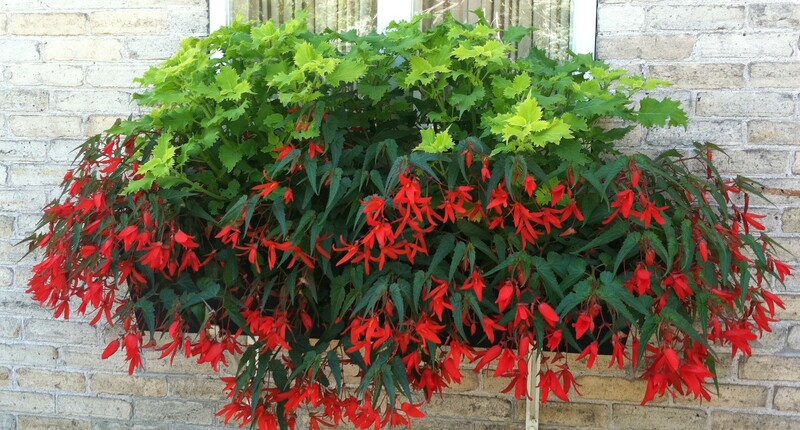 There are beautiful Caladiums on the market with very colorful unusual markings and they will shine in the shade. The foliage of Cannas is their best attribute but some varieties have beautiful flowers also. One of my full shade containers-shade is not boring! The Coleus on the market now are not your grandmother’s Coleus! Most of these plants have been bred to thrive in full sun – not shade – though there are a few that prefer shade only. 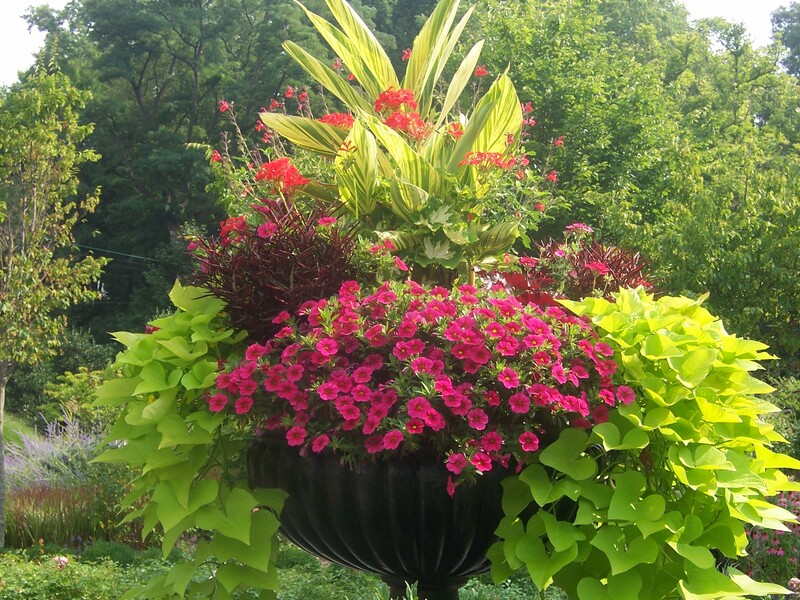 Literally, there are hundreds of varieties on the market and you could simply do lots of containers with just Coleus and have very colorful pots. Coleus are among my all-time favorites with beautiful strking foliage. I prefer not to let Coleus flower as the flowers detract from the foliage beauty, and when they appear, I remove them. Maintenance includes regular watering, at least once a day when it is hot, fertilizing with a dilute or granular fertilizer at least once a week, and pinching back plants as they grow to maintain their shape. I call this nip and tuck. If you don’t do this on a regular basis, your plants will get leggy, unattractive, and woody. It is also a good idea to elevate containers on bricks or “pot feet” so that they drain properly. If you don’t have good drainage, your plants will sulk and die! Make sure that your drainage holes are large enough so they don’t get clogged up and don’t use gravel in the bottom. I carry a long metal rod for unplugging drainage holes. The gravel just makes the pot heavier and does not help with drainage. Drip irrigation is an option if you have lots of containers that need regular watering and you don’t want to be a slave to your water can. Drip is pretty simple to set up, with all the components available at a local nursery or hardware store and they just snap together. I compare it to playing with Tinker Toys! Another helpful hint is to group your containers, especially if you have many small ones. By grouping, you achieve a bigger impact and it is far easier to take care of them in one bunch. If you do drip irrigation, grouping is essential as you use less tubing and you can hide the tubing in the adjacent pots. I have plenty of room to plant in my beds but I really enjoy planting in containers because they become a piece of art in miniature. This is my opportunity to try new annuals that look good in the nursery and go wild with the color combos. I also do it professionally for clients who don’t have the time or ability to put it all together. I rarely keep my flowers in the pot all season. They just fizzle by the end of the summer and I get tired of them. Sometimes I have three seasons of containers – a winter one with an evergreen and some pansies, then I move on to petunias, supertunias, cannas, lantanas -everything that likes heat, and finally to fall plants – mums, asters, grasses, cabbages, and ferns. I mix and match perennials, shrubs and annuals to get the most versatility and longevity out of my pots. For All Season Containers, go to my post on adding and subtracting plants for all season interest. 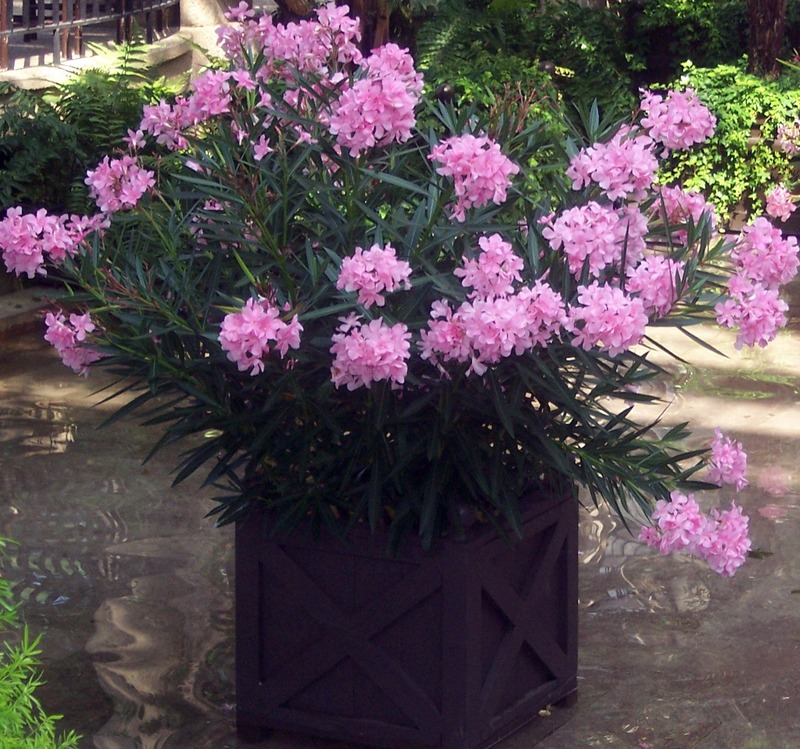 Choose a large enough container to avoid constantly watering it during long hot summers. A pot with a circumference of at least 15 to 18 inches is enough to get you going with a selection of different types of plants, plus enough room for them to grow throughout the summer. I like the light faux pots that look like real pottery, but will not crack and will retain water better than terra-cotta ones. These faux pots will last for years and you can leave them out all winter, plus they are inexpensive and portable. There are even self-watering ones available which have a water reservoir built into the container. Regardless of the type of container that you have, make sure there are drainage holes in the bottom. If there aren’t any, drill some using a large bit on a portable drill. 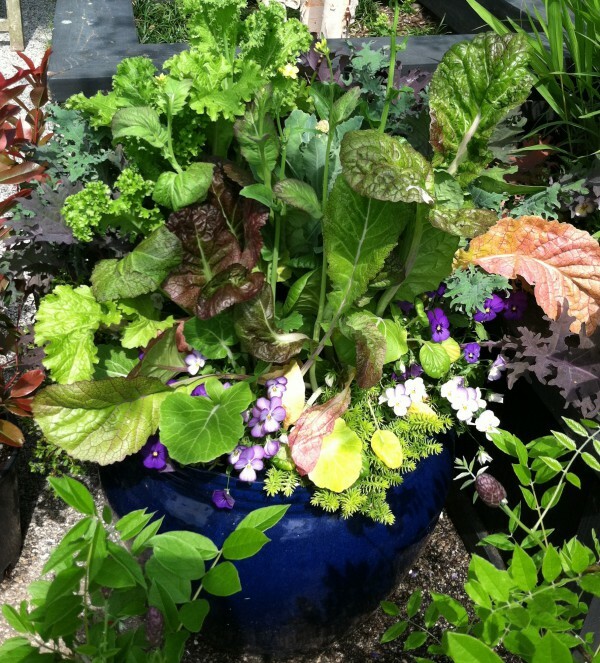 Soil or potting medium can make or break your container. 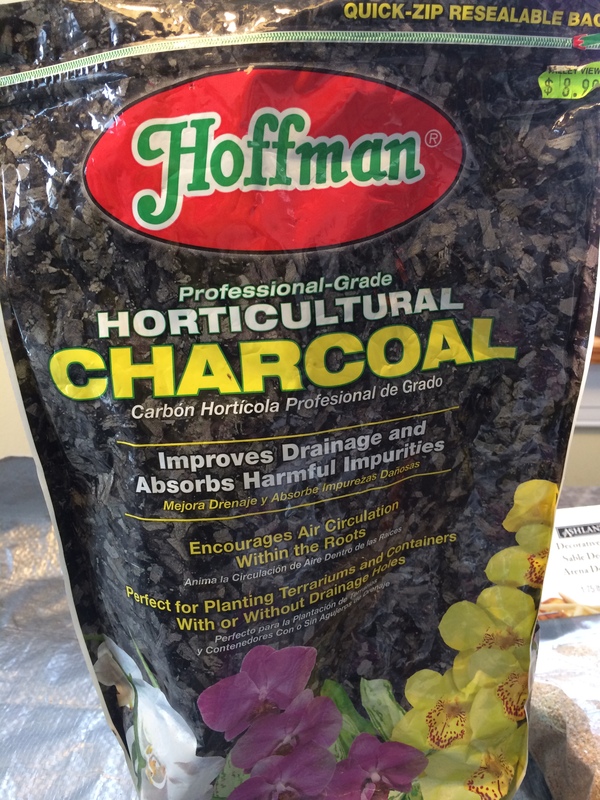 Use a more expensive potting medium that has an organic mix of compost, sphagnum moss, and perlite. There are a lot of commercial potting mixes on the market so be sure to choose one that has added fertilizer to it as container plants need a good boost of fertilizer to bloom all season long, plus regular applications. Make sure that you add a good dollop of compost in the bottom of the pot – a couple of inches at least. This is where the roots are going to reach down and use up all those nutrients to produce flowers all season long. Placement of the container is key to what plants you select. Notice if the site will get all day or part-day sunlight, or will be in mostly shade. 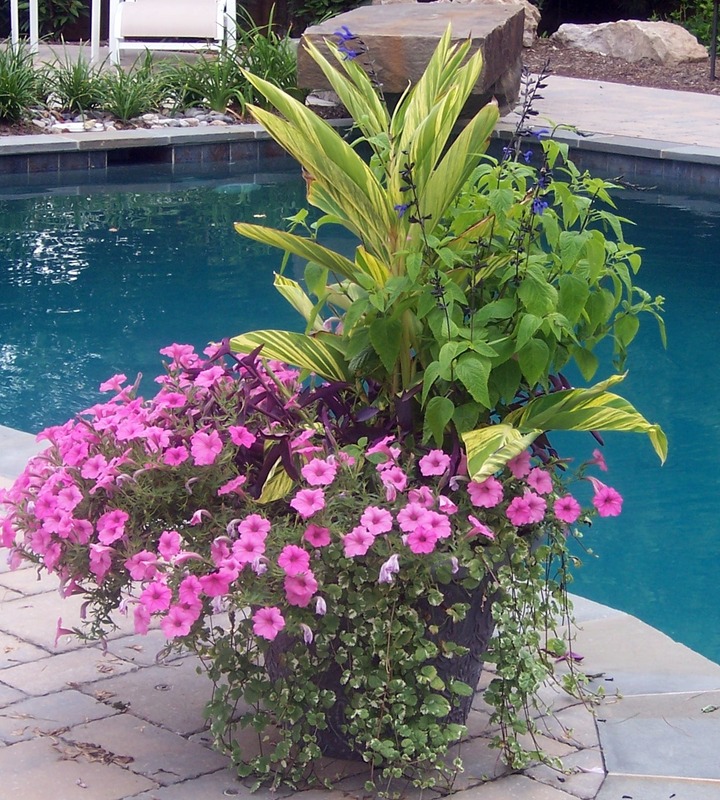 Shady container plants are just as colorful as sunny ones with careful selection of vibrant foliage. Go to the nursery and ask a knowledgeable employee for suggestions on varieties. For any situation, you want something tall for the back- a thriller, like a grass or Canna or Caladium, a filler-something shorter for the middle area, and a spiller to cascade down the sides – thrillers, fillers, and spillers! – I am sure everyone has heard this phrase. It is an overused phrase, but it really describes the process well. 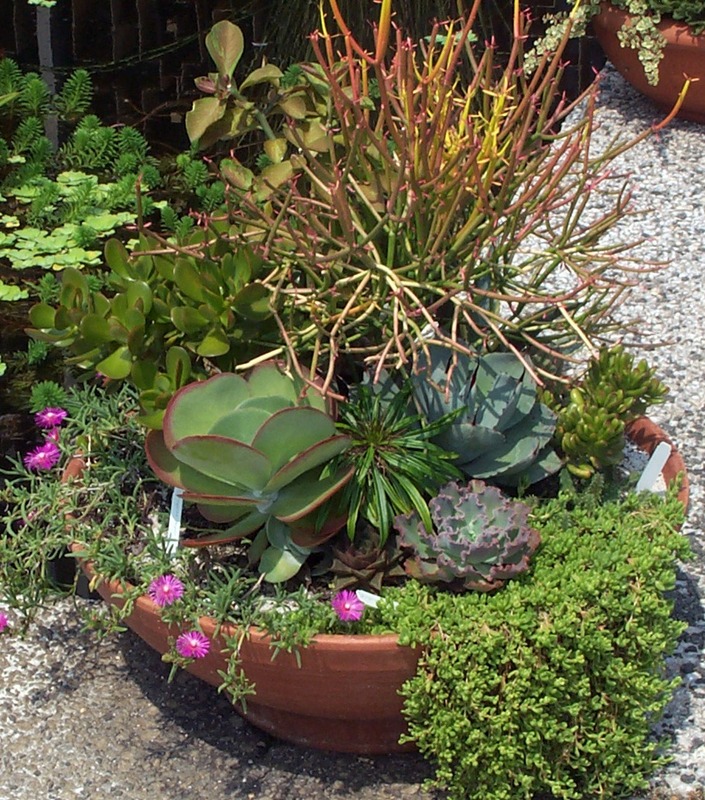 For a pot 18 inches in diameter, you would need approximately 5 to 9 plants. Of your chosen 5 plants, use a tall architectural one, a couple of fillers, and a couple of spillers. Aim for a variety of foliage sizes and textures so that each plant stands out. Planting window boxes uses the same principles as containers. To create depth you really make use of those spillers. Silver Falls, Dichondra, is a great asset for trailing down walls and window boxes. 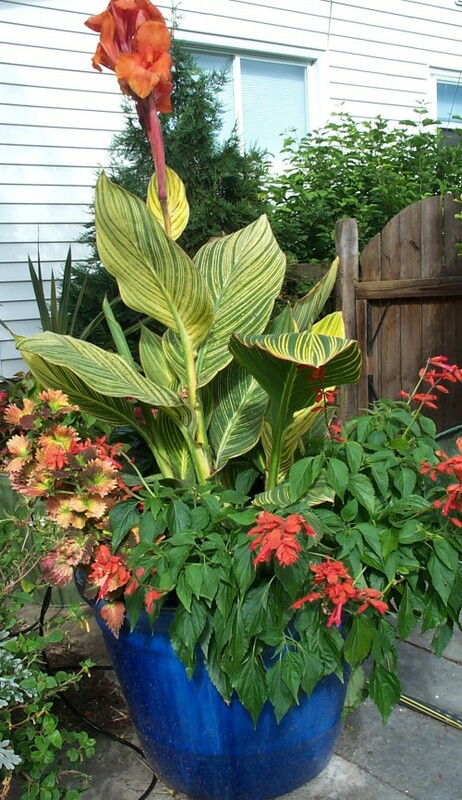 Cannas are good selections for containers – just make sure your pot is large enough. I have seen cannas get 8 feet tall or higher! For shade, try Caladiums. 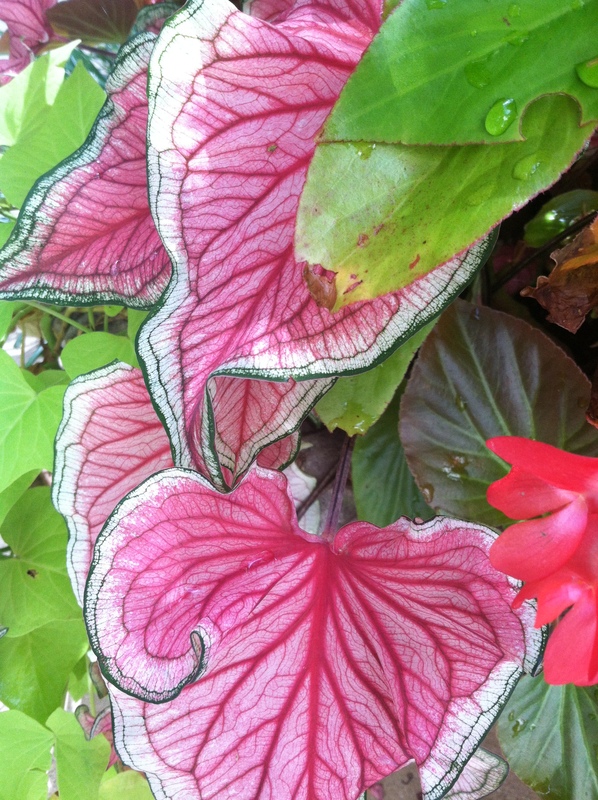 There are beautiful Caladiums on the market with very colorful unusual markings and they will shine in the shade. The foliage of Cannas is their best attribute but some varieties have beautiful flowers also. The Coleus on the market now are not your grandmother’s Coleus! Bred for both sun and shade, these plants come in a veritable kaleidoscope of colors. 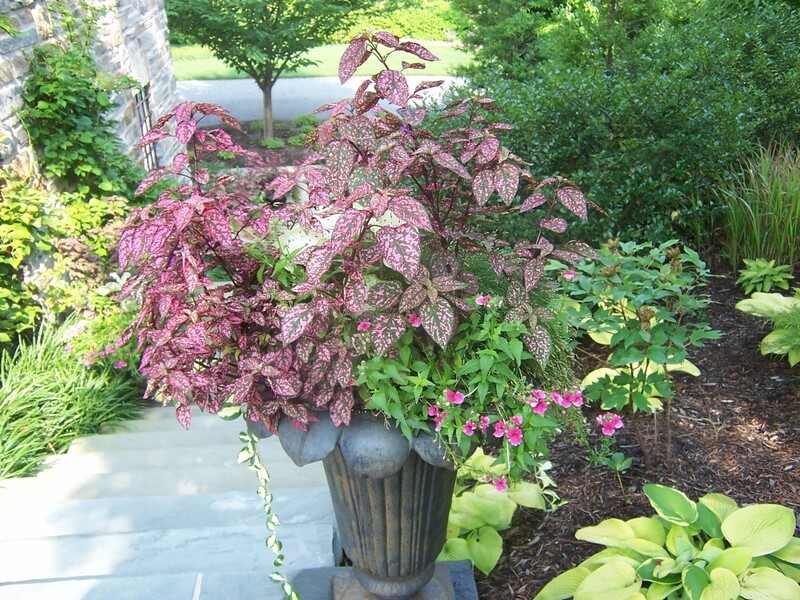 Literally, there are hundreds of varieties on the market and you could simply do lots of containers with just Coleus and have very colorful pots. 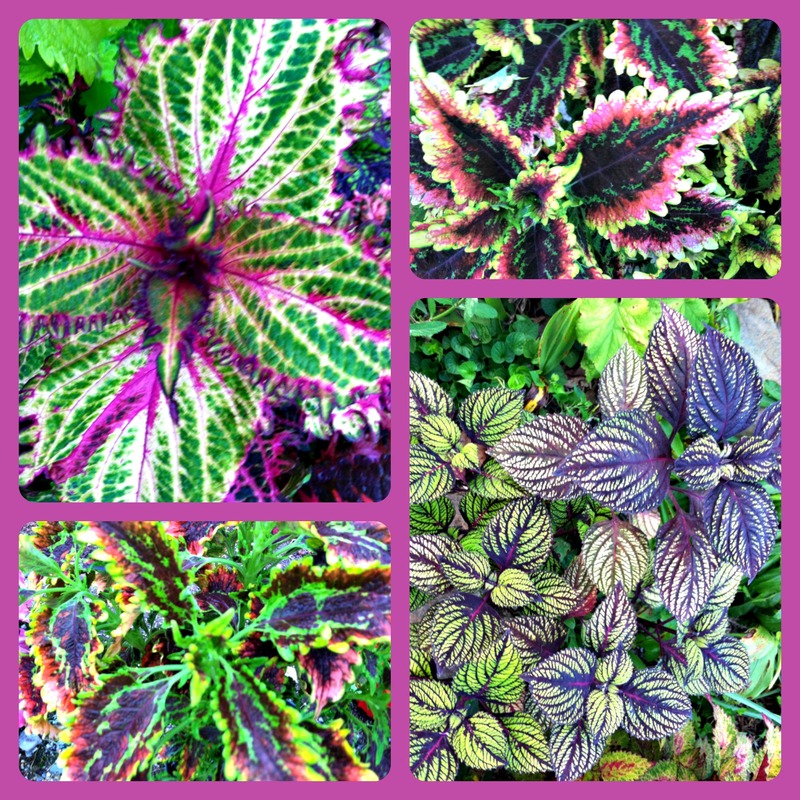 Coleus are among my all-time favorites with beautiful striking foliage with endless color combos.. 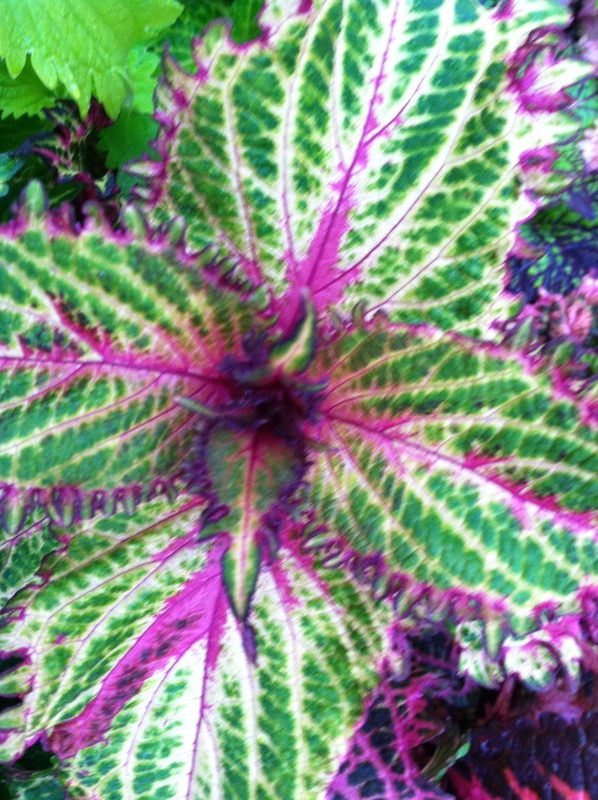 I prefer not to let Coleus flower as the flowers detract from the foliage beauty, and when they appear, I remove them. Maintenance includes regular watering, at least once a day when it is hot, fertilizing with a dilute or granular fertilizer at least once a week, and pinching back plants as they grow to maintain their shape. I call this nip and tuck. If you don’t do this on a regular basis, your plants will get leggy, unattractive, and woody. It is also a good idea to elevate containers on bricks or “pot feet” so that they drain properly. If you don’t have good drainage, your plants will sulk and die! Make sure that your drainage holes are large enough so they don’t get clogged up and don’t use gravel in the bottom. The gravel just makes the pot heavier and does not help with drainage. Drip irrigation is an option if you have lots of containers that need regular watering and you don’t want to be a slave to your water can. Drip is pretty simple to set up, with all the components available at a local nursery or hardware store and they just snap together. I compare it to playing with Tinker Toys! Group your containers, especially if you have many small ones. By grouping, you achieve a bigger impact and it is far easier to take care of them in one bunch. If you do drip irrigation, grouping is essential as you use less tubing and you can hide the tubing in the adjacent pots. Pollinators like hummingbirds, bees, and butterflies will more easily locate plant groupings. Go to Nectar in a Pot-Movable Feast to check out my pollinator container ideas.